“The Barony of Endewearde grieves as we absorb the shocking news that our beloved friend, Don Jehan Fitzalan, passed suddenly from a heart attack. Jehan has been a member of Endewearde for well over three decades. He contributed to our group as a fencer, artisan, officer, and friend.Jehan was lovingly known as “demo man” for doing over 100 demos in a time span of roughly one year, many of which were single person demos. It was largely for this work that he was elevated to the Order of the Silver Crescent in 1998. He contributed more service to Endewearde by becoming our Seneschal for several years, marshaling, and autocratting events. Jehan was a talented artisan, working closely with his mentor and friend, Master Gregory Finche while making beautiful things. He was brought into the Order of the Maunche in 2001, for his work with metal. Most notable was Jehan’s impact on the fencing community. He has been a long time fencer, marshal, teacher, and enthusiastic participant. Jehan was brought into the Order of the Golden Rapier in 2000. “Jehan’s Fighting and Fencing at the Fort” is an event he started many years ago, capitalizing on our Fort Knox, which provides a fantastic place for fencers and fighters to play. Part of his fencing legacy is his fencing company “The Fencibles,” comprised of fencers who represented some of the things Jehan most valued – prowess and fun. Most recently, Jehan proclaimed himself the Admiral of the Navy of Endewearde because after all…he had not one, but TWO boats. He was in the process of recruiting and we had high hopes for the development of a thriving Navy to help Endewearde protect the shores of the East Kingdom. Above everything, Jehan was a friend. He had a kind and gentle nature, and a wit much sharper than his blade. His joy for the game was palpable and contagious. He was the epitome of honor, and courtesy. A formal memorial service for family and friends in the many communities Jehan touched will take place sometime later in the Spring. 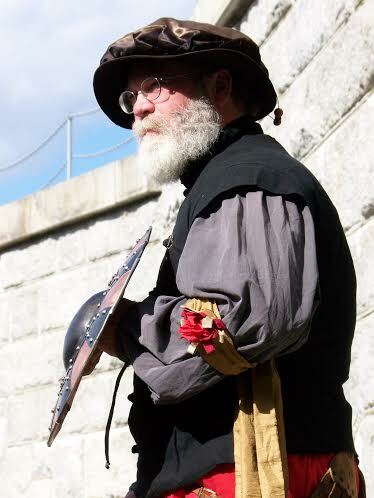 The Barony of Endewearde’s annual ‘Jehan’s Fighting and Fencing at the Fort’ event will take place, as scheduled, on Saturday, April 19th at Fort Knox State Park in Prospect, Maine, and Jehan’s friends are welcome to attend and remember him. In lieu of flowers, the family requests that donations in his memory be sent to the Maine Organic Farmers and Gardeners Association (MOFGA), Farm & Homestead Day Fund, PO Box 170, Unity, ME 04988. You can also make a gift to MOFGA on-line here. What a wonderful tribute. Thank you so much for doing this.